From worst to first! 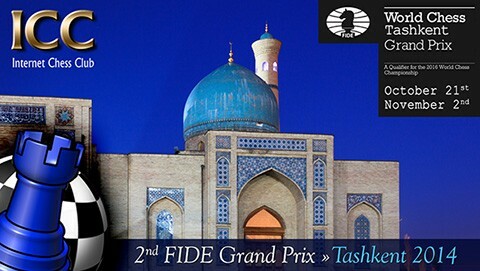 Dmitry Andreikin, who struggled in Baku only three weeks ago, finishing second last, won the second stage of the Grand Prix in Tashkent. Last round was very interesting, especially because both Nakamura and Mamedyarov could have taken the lead, had they won their games. 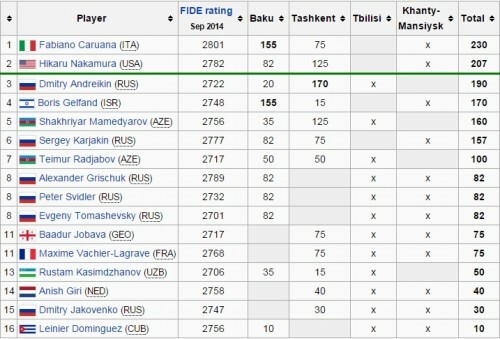 The Azeri and the American drew two hard-fought games, and Andreikin - also with a draw - kept the lead. Caruana won his game against Jakovenko, to land in third place - shared with Karjakin, Vachier-Lagrave and Jobava - which allows Fabiano to keep the lead in the Grand Prix Series overall standings. Nakamura, with two good second places, follows the Italian stud. The two leaders won’t play the next GP in Tbilisi; therefore Andreikin, who is in third place, could spring to the lead, at least temporarily, until the final chapter in Khanty-Mansiysk.